The Widow of Ballarat is a compulsively readable story of passion, adventure and a woman’s quest for independence set against the colourful backdrop of 19th century Bendigo and the goldfields of Ballarat. What inspired the book? 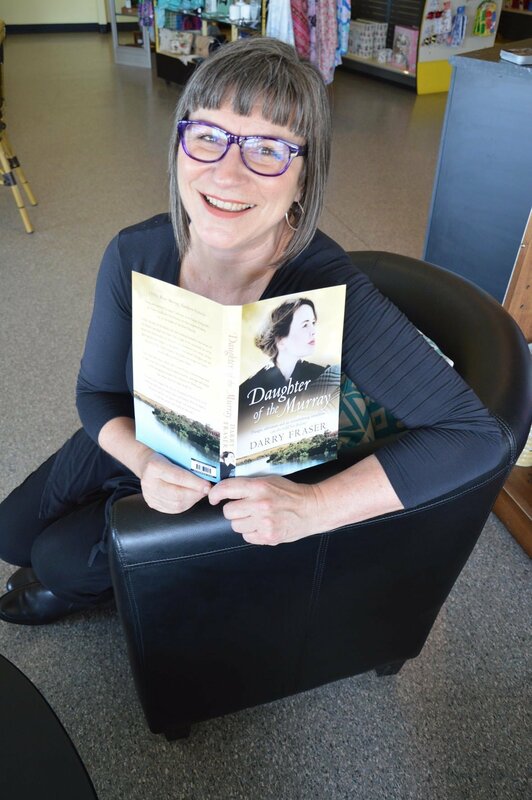 My inspiration came from a character in Where The Murray Rivers Runs – my novel published in 2017. I felt I had to explain how that character developed, so I needed to go back forty years to her parents. That was one part. Another was a dream I had, which for the most part is the second chapter in The Widow of Ballarat. Last, I had a strong picture in my mind of Tom Roberts’ 1895 painting Bail Up, and finally I had a story line. The setting of the Ballarat goldfields seemed at first to come from nowhere, but clearly things were working in my back-of-house (Stephen King calls it ‘the boys in the basement’). It wasn’t until the second chapter unfolded that I realised I needed an easily recognised major Australian historical event. As the story of Eureka had mostly been written from the male point of view, I wondered what life would have been like on the goldfields for women. Once I began the research, it became addictive. A strong appreciation of the Australian landscape runs through your writing. How are your novels inspired by Australia? As a young child, I was fascinated by American westerns on the telly. I loved anything to do with horses (although I got piano lessons instead—I soon gave that up) and people living on the land; the goodies and the baddies. I had to read in order to learn more. As I grew up, I knew Australia would have had its own stories and that many others would have brought them to light before me, but nothing had really fired me as a storyteller. So in my early twenties, after a little exploration through the outback and having fond memories of living on the Murray, I decided to set my novels in our own landscape—with horses, and dust, and heat, and paddle steamers, and—well, all of that. There is a magic in our country, and I feel a strong connection to it. It’s in my DNA somewhere, I’m sure. It’s home. I’m writing about ‘home’. The Widow of Ballarat is a piece of Australian historical fiction. What was your research process like when writing this book? How did you capture the essence of the era? Once I knew the setting and the era and having limited time to read all of the work available, which would have been a massive undertaking, I decided on two books in particular to gain insights and inspiration because they were written by women about women of the goldfields: Dorothy Wickham’s Women of the Diggings Ballarat 1854 and Clare Wright’s The Forgotten Rebels of Eureka. I also found as many of ST Gill’s paintings online depicting life on the goldfields, so they gave me a ‘visual’. I had to take a research trip, of course! So off I tottered to Ballarat and spent a wonderful time in the many amazing facilities there. A highlight for me was seeing the original Eureka flag, housed at that time in the Museum of Australian Democracy, which is said to be on the actual site and close to where the stockade was erected. As strange as it sounds, to sight the hand-done stitches still holding the flag intact was very moving. The Gold Museum is also an excellent resource. Although time-traveling at Sovereign Hill in Ballarat was fascinating, and there is huge knowledge there, I learned that it’s set in a period of time a little later than the 1850s. The protagonist of the novel, Nell, is an incredibly strong female character who endures a great deal of hardship and abuse. What inspired her character? Research shows that there were many women who endured hardship and abuse at the time. The abuse was illegal and women had recourse in the court, but often it was not brought before a magistrate. The conundrum was that if a magistrate prosecuted the man, the breadwinner, and sent him to jail, his wife and children would have no support. Many women sought to avoid the violence and tried to make a living on their own. The goldfields allowed women to be entrepreneurs and they did very well as publicans, store-keepers, launderers, cooks, teachers and tailors, and more. Why do you think historical fiction is such an important and popular genre? What does it teach us? It’s wonderful it has become popular—when I first approached a publisher with what was later to become Daughter of the Murray, I was told that no one would touch Australian historical fiction. That was 2001. I know that other, overseas settings for historical fiction were popular, so I think with Australian historicals, it’s a national pride that now drives readers to it, or curiosity (because like everywhere else, historical fact doesn’t always make us feel proud). We have our own heroes and heroines, fictional or otherwise. To be able to relate to a setting in a novel because we’ve been there or lived there gives a sense of belonging. International historical settings, for me especially the UK, brings a fascination for how life was lived—possibly unchanged—for many hundreds of years. I have Mediterranean blood as well as Celtic blood and I’m sure my DNA, once again, carries memories of the lives of ancient forebears! For me historical fiction teaches us that the human race takes a long time to learn its lessons, and that society takes a long time to make change. I’ve recently written a story in which river water hoarding is an issue. It’s still an issue today. I’ve written about women and children fleeing violence. I don’t think I browbeat, but these things are not a new epidemic—they’ve been around for years … centuries. I know young women who have told me they can’t be bothered voting, or that that they didn’t know their right to vote was hard fought and won. It seems to bewilder them, as if they have no understanding of what it’s like to be discriminated against. Education is everything—in schools, in the home, in the wider world. The genre could teach us that despite adversity, a person’s determination and a sense of self will win. And that strength and personal courage are more important than anything. I don’t mean that it’s all about the winning, but that it is about standing up again after falling.